L: 66" x W: 20" x H: 38.5"
Bradford Heights Server Make a statement in your traditional decor with the Bradford Heights server. The stunning beauty of this formal dining piece is something you'll cherish every time you sit down for a meal. Cathedral pattern veneers, two-tone finish, intricate wood carvings and dark bronze hardware complete this classic look. Make a statement in your traditional decor with the Bradford Heights server. The stunning beauty of this formal dining piece is something you'll cherish every time you sit down for a meal. Cathedral pattern veneers, two-tone finish, intricate wood carvings and dark bronze hardware complete this classic look. 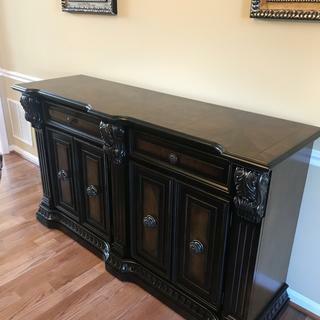 A real nice piece of furniture; excellent and unique style. Everybody love it. I waited a few years to get this piece. I finally pulled the trigger and I’m so excited that I did. Call of my guests love it too. What are the inside dimensions in the cabinet and the drawers? 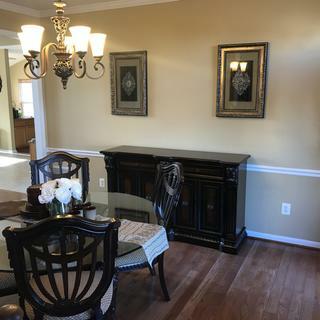 BEST ANSWER: There are two sets of doors for the cabinets. The inside cabinet for each set is L: 30" x W: 14.5" x H: 23.5" after removing the shelf. The size of each drawer is L: 20.5" x W: 13.5" x H: 3.5"
Hi Julie! Thank you for your interest in the Bradford Heights Server. I am waiting on a response for the dimensions you requested from the manufacturer. I hope to have an answer today!